I listen to podcasts while walking, commuting, or cleaning. Your mind is valuable real estate. Don’t clutter it with podcasts that don’t stimulate you or make you laugh. Move on until you are ready to hear it or delete the whole program from your line-up. I’ve come to like programs that throw in levity and fun rambling with serious information. For example when I listen to “Overdue,” a program about “books you should have read already.” I get wrapped up in the banter but I always learn something useful in the process. Joy adds life to everything. Once I pick my podcasts I forget them and let them play as they come. I throw on the candy with the professional growth. Sometimes one podcast does both. I throw total head candy into my podcast line-up. Some of the programs have head candy built in. 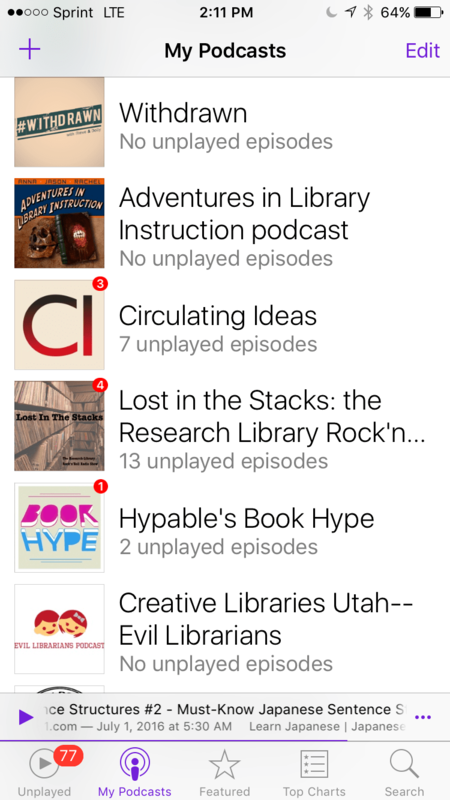 One of my favorites is “Lost in the Stacks: the Research Library Rock and Roll Show.” The hosts are really enthusiastic about different topics about librarianship but also pick some really great music to play in between. I also just have pure candy like story telling from the Moth and musical candy like Deadpod. It’s also important to turn off the podcasts. Sometimes I just irritated by the noise. Sometimes I just need to hear myself think. “Weeding” is a term used both by librarians and gardeners to describe the process of getting rid of what inhibits growth. Search, find, delete. Grow your mind and life through podcasts. 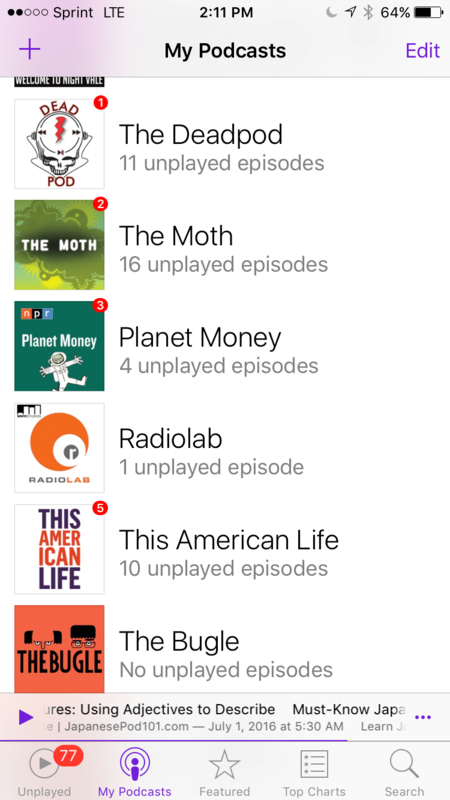 Please share your podcast recommendations. Here’s a short-list of what I’m listening to these, please share your play list! T is for Training Great podcast about libraries, training and learning. Expands my notions of how libraries can shape learning. Cyberpunk Librarian High-tech on a low budget. Daniel Messer explains a variety of technical and other topics overlayed with relaxing, atmospheric music. The show is not just for librarians. I really appreciated the podcasts he has done on Minecraft, electronic notetaking systems, and physical notebooks. Overdue “A podcast about the books you’ve been meaning to read.” I love the banter and meanderings of the hosts and I always learn something new while having vicarious fun. Secret Stacks “Secret Stacks is YOUR comics in libraries podcast! Secret Stacks invites you to join a conversation between Kristin LaLonde and Thomas Maluck, two librarians who will share comics and graphic novel news, readers advisory, guest interviews, and tales from the front lines of conventions and library services.” Fun. Helps me get to know the comics and graphic novel universe so I can recommend things to my students. Librarians Assemble “Librarians Assemble! is a bi-weekly podcast featuring librarians who are passionate about comics, and how they use that passion to promote comics in their field.” Another awesome libraries and comics podcast. Lost in the Stacks “The one and only Research Library Rock’n’Roll show! Ameet and Charlie from the Georgia Tech Library pick a theme and free-associate an hour of music, interviews, and library talk every Friday for lunch. You’ll hear indie rock, pop rock, alt rock, New Wave, and the occasional oddity in between interviews with students, faculty, and librarians.” I wish I could be a cool librarian like these hosts. Great ideas about building internet business by building relationships and serving people. The link above is an episode where he asks different entrepreneurs what they wished they’d known before they started their first business.